New Wave Domesticity: new tattoos = home made cat & dog treats! Last week, I got a pair of new tattoos that I am really excited about. They are the paw prints of two of my favorite things in the world : my cat (Milo) and dog (Ellie). In honor of my new tattoos, I thought it might be time for a pet themed blog post! 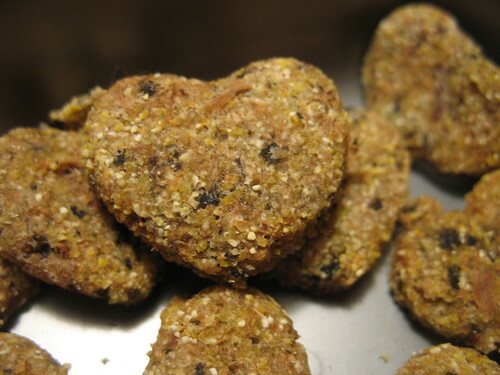 My pets are my kids and as much as I love to bake special treats for my loved ones, sometimes it is also nice to bake some little treats for my furry loves. Also, most comerical pet foods and treats are made from sub-standard ingredients and a lot of chemical fillers and perservatives that are not exactly the best things for our pets to be eating, so it's nice to make something and know exactly what you are feeding your animals. The addition of parsely in this is completely optional. I added it because I happened to have it on hand and parsely is a safe natural breath freshener and my dog has some STINK breath, so I figured it was worth throwing in there! Mix all your ingredients with a wooden spoon in a medium mixing bowl. 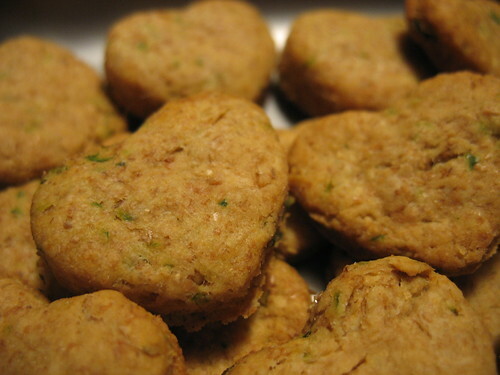 Roll the dough out to about 1/4" thickness and cut the treats out to a size that fits your dog. 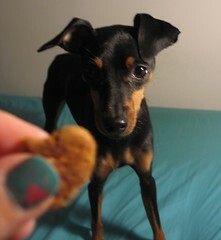 I used a tiny little heart cookie cutter because I have a 7 pound min pin with a tiny mouth, but you can use a bigger cookie cutter or just cut a few rectangles out for a more no fuss approach. Bake at 350 degrees for 10 minutes until brown. 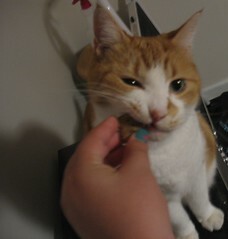 My cat's favorite thing in the entire world is nori (seaweed). I buy little boxes full of nori strips at the asian market and he goes comepletely insane for them, so I decided to attempt to make treats using nori. You can skip the nori part if you don't have it readily accessable. Tear your nori up into tiny peices or pulse it in the blender for a moment. Combine all your ingredients in a medium bowl and mix with a spoon untill well blended. The dough for these is rather gooey, so I suggest using a silpad or spraying your pan with oil before you bake. You can roll these out and cut them up, or just grab little balls and flatten them as you might with people cookies. Bake at 350 degrees for 15 minutes until brown. Did you try them? I think it is your duty. I am thinking the tuna ones might be good. 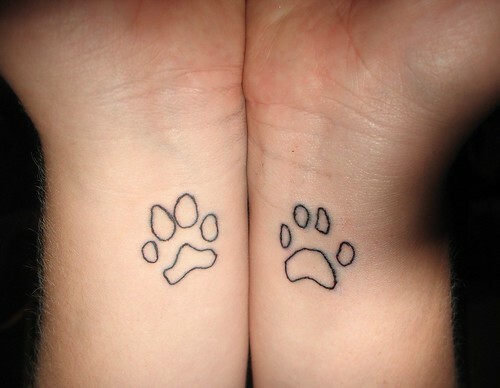 Hi there, I have been thinking about getting another tattoo and I wanted my cat's paw print too, how did u get the print? I bought an ink pad but the shape of the paw does not come out right. that's so funny! i have a miniature pincher named ellie...i love her to death!